In this article we will be taking an in-depth look at LED grow lights and why they are perfect for growing cannabis indoors. We will also cover what they do and how to use them, as well as reviewing three of our current favorite LED grow lights on the market. 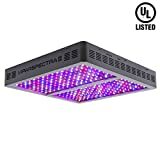 What kind of LED grow light do I need? What’s a LED Grow Light? Are there any benefits of using LED Grow Lights? What about the watts needed for it to operate? LED bulbs are hugely energy efficient. This means that they offer more light per Watt than any other kind of light. The electricity they do use goes almost entirely into providing light, and hardly any of the electricity goes to waste as heat or sound. Because of this, LEDs also run much cooler than other lights, again saving on electricity costs, but also stopping the grow light from overheating and preventing your cannabis plants from drying out. LED lights are generally much easier to install and use. The bulbs have a very long lifespan (usually up to 50,000 hours) so it is unlikely that you will have to replace any bulbs or chips even after many years of constant use. Luckily, this is very simple. Most grow lights come with their own instructions, so it is simply a matter of following these and you’re all set. Usually LED grow lights come with their own hangers, but if not don’t worry, as they are relatively cheap and easy to find. Once you have both the hangers and the lights, just hang it up at the right height (check your weed’s requirements and the manufacturer’s recommendations first), plug it in and switch it on. One of the first things to figure out is how big your grow area is, and how many plants you can fit in it. You will need to buy a grow light that has a coverage equal to or even greater than the area of your grow space for the flowering stage because LED lights can cover much more ground during the vegetative stage of plant growth, as the plants won’t need as much light. Another thing to take into account is the type of light the LED lamp will emit. Most of the larger, higher quality LED grow lights will be suitable to use throughout the entire growing process, but some only specialize in certain light wavelengths that only suit certain growth stages. For example, if you have a mostly blue light LED lamp, you will be fine during the vegetative stage. However, when your plants begin to flower, you will need to buy a supplementary red LED grow light as this is the light wavelength that cannabis plants need to flower. The final thing to mention is the power of the light. In the past, when growers used HID or HPS grow lights, they had to know the exact wattage of each light to be able to change them out for bulbs that provided different light wavelengths for the different stages of plant growth. LED grow lights are also labelled for the wattage they put out, but they do not require the same wattage input as they are more energy efficient. You will need to know the light’s wattage to fit your growth needs. An easy guideline to help you is that for every square foot of grow space you will need about 40W minimum, with the optimal wattage being about 80W. So for example, let’s say your grow space measures 3 feet by 3 feet, which is 9 square feet total. The minimum wattage for this space would be 360W, and the optimum would be 720W. You could either buy one 720W LED grow light, or daisy chain two 360W LED grow lights together to create the most optimal light source for your plants. Budget – if you have a low to medium budget, you will have to compromise on certain things to stick to your budget, for example you could buy two smaller, cheaper lights instead of one large, expensive one. We have picked out three LED grow lights to review below, to help give you a better understanding of what is currently on the market. This powerful LED grow light enables you to turn certain lights within the panel on and off as and when you need, giving you the power to create and maintain optimum lighting conditions for your marijuana plants. When your plants are maturing, the vegetative switch creates more blue light to help your plants’ leaves and stems grow. Once your plants reach maturity and begin to flower, reverse the switch to provide your plants with the red light they need to flower. The Viparspectra LED grow light emits 1200W of power, but only draws about 524W to do so. This energy efficiency will help save money on electricity bills in the long run. The panel is designed to balance its light coverage, making sure all your plants receive equal quality light. It also has built-in aluminum heat sinks and 4.72-inch cooling fans, making sure that the panel does not overheat and ruin your crop. Finally, this grow light comes with a 3-year warranty, so you know the product was built to last. For the high price point, you get a powerful, full spectrum LED grow light, with a veg/bloom switch for extra flexibility and control. The only real downside is that the output wattage is known to fluctuate. The manufacturer claims that the 1200W output is accurate, but this can sometimes fluctuate between 900W and 1000W. This Morsen grow light is made with 10W double LEDs, offering an output of 2400W for a power consumption of only about 450W. This is a hugely powerful light for its very low energy consumption, which makes up for its high retail price. It has not one but two on/off switches located on the back of the panel, letting you be in control of the brightness of your plants’ light source. If you have a very large grow setup, you can even daisy-chain up to three panels without having to buy an extension cord. Each panel comes with its own built-in cooling fans, so there is no need to worry about overheating or potential fire hazards. These Morsen lights even come with a 3-year warranty too. 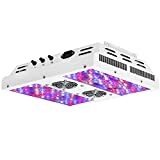 This is an expensive grow light, and it does not offer the luxury of being able to turn on/off certain light wavelengths to suit your plants’ different growth stages. However, it is an extremely powerful light with great coverage and the option of daisy chaining up to three lights at a time, which is perfect for big time growers with many plants to tend to. Whilst this grow light is not as powerful as the Morsen 2400W above, it does provide full spectrum light with secondary optical lenses for better light dispersion and penetration, as well as not one but three dimmer switches for ultimate brightness and light spectrum control. This means that you can tailor your light source to your plants’ growth stages more accurately, helping your plants produce a higher yield of better quality bud. The actual power output of the Viparspectra 450W dimmable light is about 400W, but the input is only 210W, again saving you money on utility bills. This light has built-in aluminium heat sinks and cooling fans to prevent overheating, and comes with a 3-year warranty. 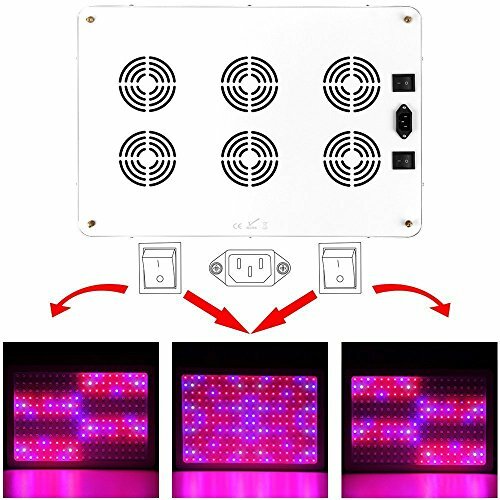 The price is perhaps the only con for this LED grow light, but with the light spectrum control that the dimmer switches provide, and the 3-year warranty, at least you know that your money is being well spent. LED is an acronym for “light emitting diode”. This is intended to help indoor plants grow well, despite the absence of the natural light from the sun. This type of light is designed with many wavelengths, consisting of visible and invisible lights such as UV and IR rays. This light directly acts on the plant to increase its growth and yield. Can these tiny lights really help plants grow even without sunlight? Blue lights are absorbed more by plants compared to other colors such as green. This means UV rays can trigger plant growth. On the other hand, infrared rays are best to help with blooming and germination. Grow lights can be adjusted, according to your desired wavelengths. During the vegetative phase, UV rays absorption would facilitate cell division. Once cell division will be increased, it will hasten the plant’s growth and result in a better yield. If you intend to treat your plant and it is in its flowering stage, use lights with infrared rays or “IR”. This will be absorbed by the buds as well as the apex of the plants, resulting in a quick and heavy blooming. Use grow lights with wide wavelength options. This makes it easier for you to make the necessary adjustments, depending on the effects that the plant needs. Before LED lights were discovered, there were lights that already existed which serve the same purpose. Among these are the high-pressure sodium lamps as well as the fluorescent bulbs. However, they are not as helpful for small grow room owners who only require tiny compact structure. The lights will require so much space for set-up and proper ventilation must be provided considering the heat that it produced. Hence, small grow room owners opted not to use those lights. LED grow lights are built with compact structures. Hence, they are easy to handle. Installing them is pretty straightforward. All you need is to hang the light above the plants at a certain required distance. For more coverage, LED lights can be installed side by side, thanks to its compact structure. 3. Setting up ventilation is no longer needed. LED lights don’t heat up. Hence, you need not worry about the room’s ventilation system. No need to set up big fans or huge ventilations too. To estimate the needed watts, you need to do some math first. This is done by calculating the area as well as the numbers of plants needing light. If the ratio of the square foot area and the plant is 1:1 then you will need 25 watts per plant per square foot. For a ratio of 2:1 (square foot to plant), you will need 5 watts per square foot, and so on. Hence, for a 250 watts lamp, it can cover around 8-10 plants below it. The legalization of cannabis for medical and recreational use (as well as home growing) in many states and countries around the world has led to a boom in the manufacturing of efficient products and equipment for home growers. LED grow lights are an example of one of these highly efficient products that modern marijuana growers simply could not live without. Hopefully, this guide has given you a bit more information on why LED grow lights have become so popular, and the reviews have given you an insight as to what is on currently on offer. Good luck with your LED grow light purchase, and happy growing!